River Rock and Black Mosaic Gold (pictured) are dichotomies in the natural stone world. Black Mosaic Gold is a granite. 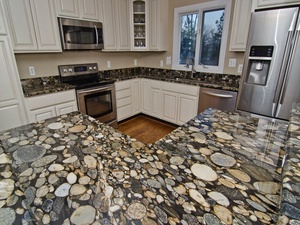 River Rock is a man-made blend of natural stones held together by epoxy. But to gaze upon them, you find they are more kindred than dissimilar. Coming across a Black Mosaic Gold kitchen countertop is like staring into a crystal-clear stream flowing over a bed of rocks, not a slab of granite. River Rock, usually found as flooring, looks like smoothed-by-a-stream stones as well, with good reason. Also known as Epoxy Stone, River Rock consists of a layer of rocks from a river and then heavily coated with urethane or epoxy to hold the rocks in place and to provide a smooth surface. River Rock is a favorite for patios, pool decks, screened-in porches and outdoor showers. On occasion, it will make its way indoors, adorning laundry room or sunroom floors. The natural stone mix can also be used to cover concrete slabs or basement floors. You often find it commercially in showrooms and warehouses. Besides its outward appearance, Black Mosaic Gold differs from other granites in that is not an igneous rock, but a type of sedimentary rock called a conglomerate. It’s made up of individual stones that were tumbled smooth by glaciers and then bonded naturally with a fine grain called a matrix. Its appearance, with a black background, is stunning as each stone has different colors and shapes, but still exhibits a cohesive look that only Mother Nature could create. Black Mosaic Gold mesmerizes with its original, non-traditional look, as no two slabs are ever alike. No matter which you choose for your particular decor, you'll always be reminded of a peaceful flowing river and nature being a part of your design world.